I am home sick today with a very sore throat, tonsils the size of basketballs and scratchy like sandpaper. I tossed & turned all last night, fever-dreamed, and kept my boyfriend up with sickly breathing that he likened to the head witch of Dario Argento’s horror masterpiece, Suspiria. Gross. And within all this fever-dreaming, I recognized that when I’m sick, I wish I was at my Nana’s house, sweating it out on the thin sheet-lined couch at the back of the living room, watching “People’s Court” and sipping ice water from her impossibly heavy glasses. I must have been sick at her house in Walpole, Massachusetts, a suburb of Boston, only a handful of times: at 6, I was overwhelmed with a violent stomach flu after eating a large slice of chocolate cake at a mid-summer family party; the other time, when I was ten and besieged with pneumonia, fighting off a raging temperature of 104 degrees. My stomach aches often multiplied when I had to go to Nana’s house to visit my dad. He was just so hurt and angry, and nothing I could say or do could make him feel better. I would curl up on the couch in Nana’s living room or lock myself in the bathroom, and refuse to go upstairs to him. Instead, I would hold my stomach and try to breathe. Nana was a really good sport about this. She accompanied me to the doctor’s, where they primly closed up my manila patient folder and told her there was nothing wrong with me. And Nana let me skip out on seeing my dad a lot, instead letting me talk about how sad I felt, and how much I missed being in the woods at my old house. But everyone has a ceiling. At eleven, I learned that. After missing another scheduled visitation with Dad, I came back to visit with Nana and show her my new tiny cactus in an equally tiny, terracotta pot. Dad had taken my three siblings out candlepin bowling, Nana was alone, seated in her sheet-covered recliner watching the Maury Povich show. When she saw me, she glowered, and spat, “You should have been with your father today. You should be ashamed.” And that was it. I ran from her then, avoided her for years. 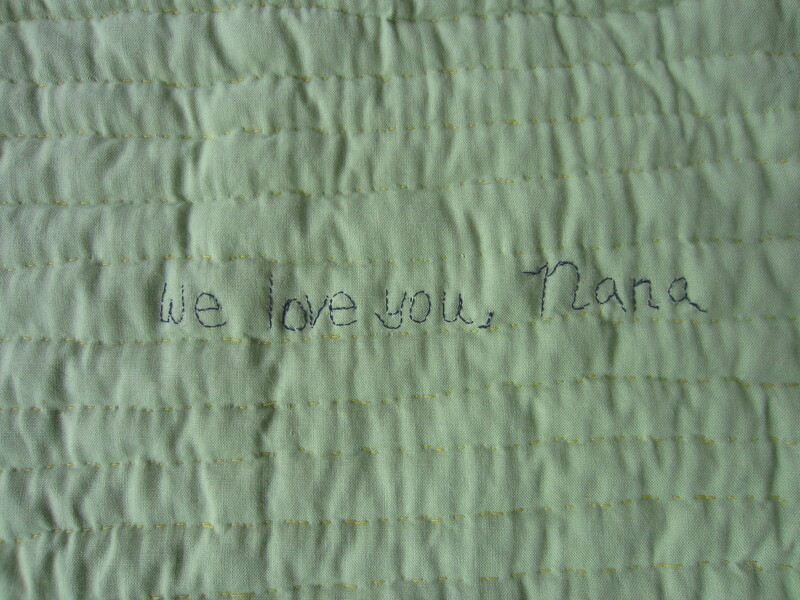 I made this quilt for Nana to heal our broken heart-strings. I hadn’t quilted in years, so I no longer had a cutting board or rotary cutter, and since I was on a graduate student budget, I couldn’t afford the materials. 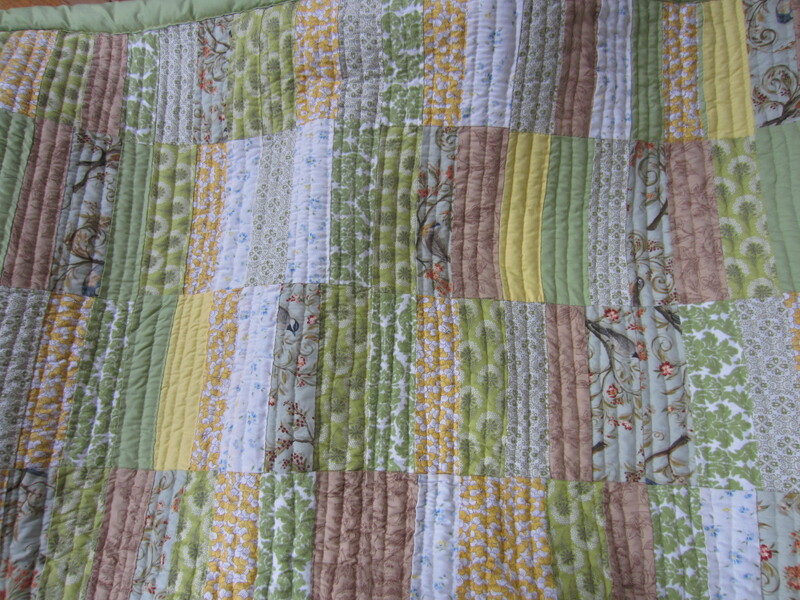 Instead, I hand-cut the individual pieces of this quilt before sewing these pieces together by hand. 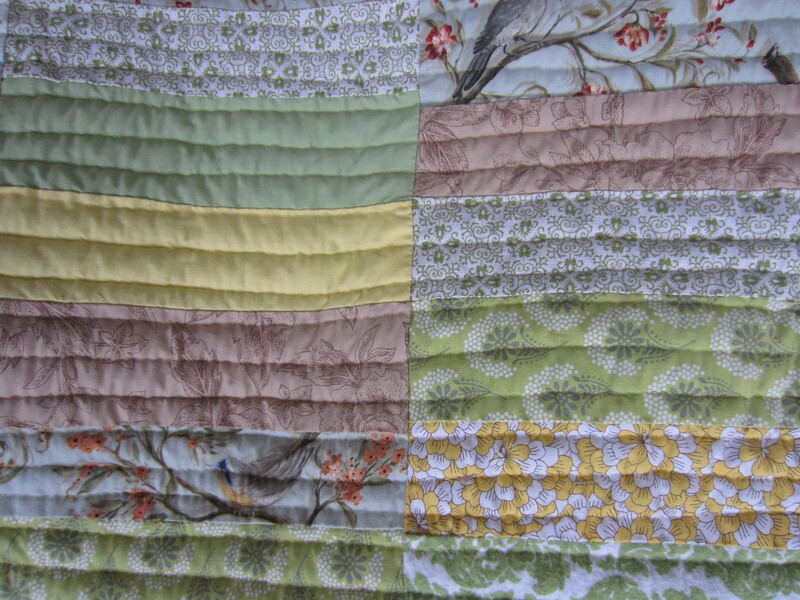 Then I took three weeks to hand-quilt all of the life lines onto the quilt, binding Nana and I’s past, present and future together. 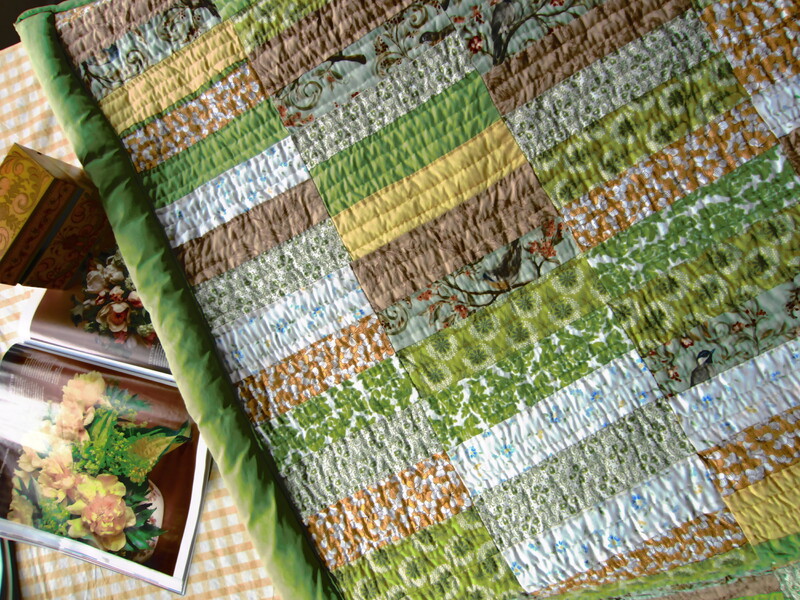 The making of this quilt was very physical; my hands ached from the yoke of the fabric scissors and my fingers were often pricked pulling the pieces together. I picked fabric that reminded me of Nana: her yellow flower linoleum, her brown house, her sheets draped over the furniture, her love of birds. In the last year of her life, I took it upon myself to visit her as often as I could. I let her make grilled cheeses for me, serve me cottage cheese with pepper sprinkled on top, and drink chocolate milk from those heavy, heavy glasses. I watched TV with her, and listened to her funny stories. I took the time to remember and reconnect with all the wonderful things about Nana. She was such a devilishly funny, fiercely loving person, and I attribute my own dark wit and compassion to her. With her again, sad as she was in the wake of my grandfather’s death, I realized nothing had ever changed really. We were still as important to each other as we’d ever been. 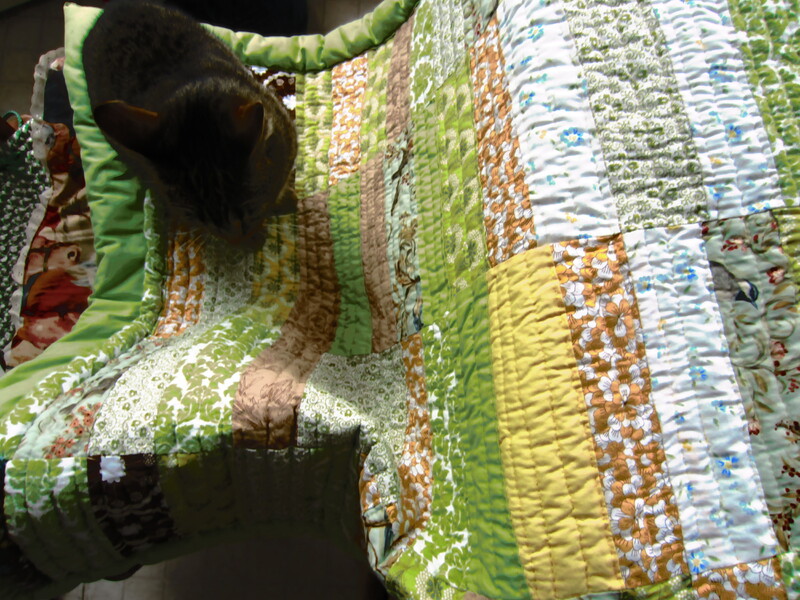 I gave her this quilt a week before she died, the quilt she’d unknowingly be buried with. It was a Saturday afternoon in early June. The relief I felt, when I saw her holding the quilt; all the hurt, disappointment, shame seemed transformed into this soft blanket. I watched as her fingers traveled the lines I sewed like she was reading our story, our apologies, reciting the infinite love we have for each other and in spite of everything. This is truly beautiful, Jess. Thanks.